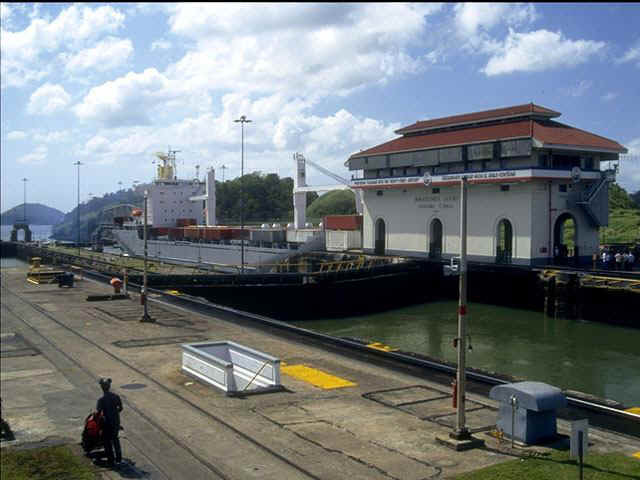 Panama occupies a strategic spot in the world because of the 'Big Ditch', started by France and finished by the US during Teddy Roosevelt's presidency. This string of islands and cays lie along the east coast of Panama and have been controlled by the Kuna Indians despite sovereignty by Spain, Colombia, and now Panama. The men fish and tend coconut plantations and the women make and sell molas for hard cash. Molas are reverse-appliqué creations where multiple layers of cloth are cut to make colorful pieces of art. A delightful anchorage, with old Spanish forts on the surrounding hills - this is a great stopping spot between the San Blas Islands and the Canal. Our transit went very smoothly, thanks to a well-trained apprentice pilot and Nat Gladding, a senior Panama Canal pilot, owner of a Shannon 38' who provided valuable advice and put us in with a not-so-huge freighter. The towns around the Canal are memorable - Colón is a dangerous place that looks like a perpetual war-zone; go shopping in groups and take taxis wherever you go. Balboa (Panama City) is safer, upscale with lots of high tech gear. The Duty-Free Zone near Colón is a good source for electronics and liquor.